The Monacelli Press, 9781580935081, 224pp. 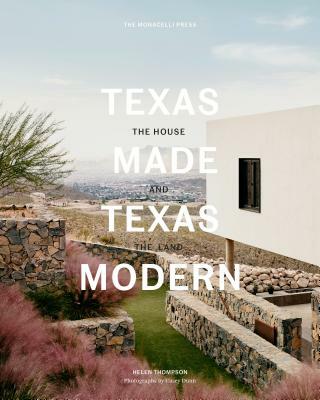 A compelling survey of Texas houses that draw both on the heritage of pioneer ranches and on the twentieth-century design principles of modernism. Helen Thompson and Casey Dunn, the writer/photographer team that produced the exceptionally successful Marfa Modern, join forces again to investigate Texas modernism. The juxtaposition of the sleek European forms with a gritty Texas spirit generated a unique brand of modernism that is very basic to the culture of the state today. Its roots are in the early Texas pioneer houses, whose long, low profiles express an efficiency that is basic to the modern idiom. This Texas-centric style is focused on the relationship of the house to the site, the materials it is made of--most often local stone and wood--and the way the building functions in the harsh Texas climate. Dallas architect David R. Williams was the first to combine modernism with Texas regionalism in the 1930s, and his legacy was sustained by his protégé O'Neil Ford, who practiced in San Antonio from the late 1930s until his death in the mid 1970s. Their approach is seen today in the work of Lake/Flato Architects and a new generation of designers who have emerged from that distinguished firm and continue to elegantly merge modernism with the vocabulary of the Texas ranching heritage. Twenty houses are included from across the state, with examples in major urban centers like Dallas and Austin and in suburban and rural areas, including a number in the evocative Hill Country. Helen Thompson is a nationally known writer whose areas of specialty are interior design, architecture, kitchen design, and food. Helen was formerly a food writer and editor for Texas Monthly magazine, where she worked for 17 years. She was also the Texas city editor for Metropolitan Home magazine for 14 years. While at Metropolitan Home, Helen wrote about houses, restaurants, and gardens and produced many of the features shot in Texas during those years. She has also written and produced articles for Elle Decor, Architectural Digest, House Beautiful, Martha Stewart Living, Western Interiors, Traditional Home, Veranda, Country Home, and many other magazines. She is also the author of Marfa Modern, The Big Texas Steakhouse Cookbook, and The Mansion on Turtle Creek Cookbook. Casey Dunn is an Austin-based architectural and landscape photographer whose work has appeared in Dwell, the New York Times Magazine, Interior Design, Architectural Digest, Architectural Record, and Paper City Magazine. "Dunn’s photos are inviting and supremely confident, and Thompson’s choices are revealing and fascinating. For anyone intrigued by architectural modernism (or for anyone purchasing a home who needs to steal some great ideas!)." "A gorgeous display of modernist architecture and interior design that's particularly Texan."